My girlfriend Alyssa informed me that she joined two fantasy football leagues this year. This means, of course, that I just joined two fantasy leagues this year. She’s been playing fantasy with her friends for the last two years, but I’ve been the one doing the research, drafting, and making the pickups. I don’t mind doing it one bit, but this year I may have spread myself a little too thin with running my own leagues and decided to inform Alyssa that I will not be running her teams. She is in panic mode currently, as her drafts are coming up this week. I decided I should write a comprehensive draft guide for her and the rest of the fantasy newbies that are nervously approaching their drafts this year. NOTE: This guide is for newbies that actually want to win. If you’re just going to draft guys based on their hotness (may I suggest the dreamy Eric Decker? 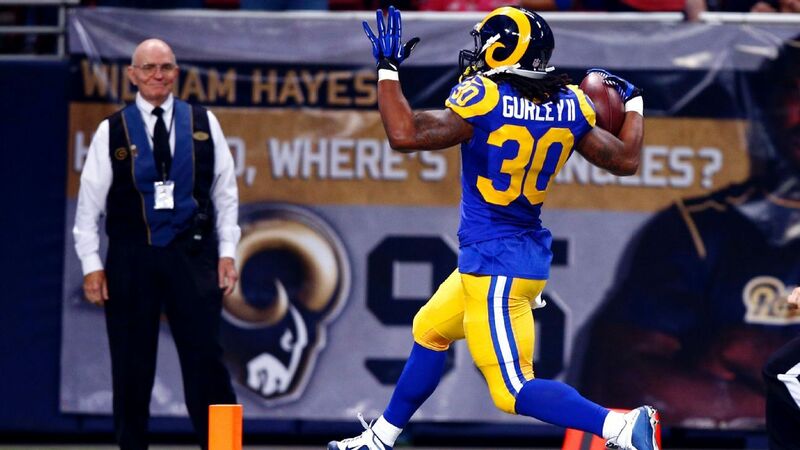 ), awesomeness of their names (Barkevious Mingo has to be top pick in IDP formats), or jersey colors (can’t get much cleaner than Todd Gurley in those LA Rams throwbacks), I say go for it! But you don’t need to waste your time reading this guide. Eric Decker should be the clear #1 pick in all Hotness formats. First things first, it’s important to understand the basics of the game itself. I’ll go over the essential terms and concepts of football, and then talk a bit about each position involved in fantasy. If you’re a football fan who knows all this stuff and just wants to know how to draft, go ahead and skip ahead to “Your League” section. Touchdown: A touchdown occurs when a player crosses the goal line with the ball in their hands (or catches a ball in the end zone). This counts for six points for the scoring NFL team and usually six fantasy points for the player who scores. Interception (Pick): This occurs when a quarterback throws the ball to the opposing team. Reception: This occurs when an offensive player catches a forward pass. Fumble: A fumble occurs when an offensive player that has gained possession of the ball loses possession of said ball. Target: A target is a pass that is intended for a player. It doesn’t matter if the player catches it or not, if it was thrown his way, it is considered a target for that receiver. Carry (or Rush or Attempt): A carry/rush/rushing attempt occurs when an offensive player attempts to carry the ball forward against the defense. It is not considered a carry if the ball is passed forward first. Most fantasy leagues involve the following positions: QB (Quarterback), RB (Running Back), WR (Wide Receiver), TE (Tight End), K (Kicker), and DST (Defense & Special Teams). Kickers are pretty self explanatory. They accumulate points by kicking field goals and extra points. They are fairly unpredictable and should be one of your last picks. The DST isn’t really a real position, it’s actually two whole phases of an NFL team. You draft an entire team, opposed to a player. They are also fairly unpredictable and should be taken late-ish in your draft. Let’s focus on the offensive fantasy positions. Below is a graphic showing each position and where they traditionally line up before the snap. Here is a basic offensive formation. You can see where the four main fantasy positions typically line up on the field. Quarterback (QB): Quarterbacks, AKA the Glory Boys, touch the ball on every play. They take the snap and typically either hand the ball off or throw it. Some QBs, like Cam Newton or Russell Wilson, are also exceptional runners and score many of their points by running the ball themselves. Only one is on the field at a time. Running Back (RB): Running backs usually line up behind (or beside) the QB in the backfield. They carry and catch the ball. They typically take the most amount of hits and punishment. There is typically only one running back on the field at a time, but they are sometimes accompanied by a fullback: A running back-like position that specializes in blocking but is unfortunately irrelevant in fantasy. Wide Receiver (WR): Wide receivers typically line up wide of the formation. They run downfield and catch passes. There are anywhere from zero to five wide receivers on the field at one time, but typically only two or three. They are usually the fastest players on the offense. Tight End (TE): The tight end typically lines up on the end of the line, in a down position. They split their duties between blocking and running routes. Tight ends are usually huge, strong athletes because they need to be able to push defenders around while blocking as well as run routes and catch tough passes. They also take a ton of hits and punishment. FLEX: A FLEX is not a real NFL position, it is used only in fantasy. It is usually used as a slot for any RB, WR, or TE. Superflex leagues also allow you to start a QB in a FLEX slot. Before I give anyone fantasy advice, I have to know your league settings. League settings can change everything about your player rankings and draft strategy. You should be able to get them from your commissioner, or just log in to your league and take a look. Honestly, one of the main reasons I first built SmartCheatsheet was because I had too many leagues with drastically different settings and I couldn’t figure out how to value different players. After you finish this guide, try creating your league in the SmartCheatsheet tool. It should take your settings into account when it spits out your default cheatsheet. Here are the most important settings you need to take into consideration. How many QBs can you start? Most leagues only allow you to start one QB. With the sheer amount of QBs that put up solid numbers in the NFL nowadays, QBs in one-QB leagues are not that valuable. That all changes when you play in a 2QB or the afore-mentioned Superflex league. Each QB should be taken 3-4 rounds earlier in these formats. Make sure that the rankings you’re looking at reflect this. How many points per reception? Ten years ago, fantasy football was completely dominated by running backs. Over the last few years, scoring settings have slowly transitioned into awarding some amount of points per reception, in order to normalize the scoring between running backs, wide receivers, and tight ends. At the same time, the NFL has transformed in several ways that also devalue running backs. First, teams pass much more than they used to. Second, teams now are much more likely to use a committee of backs to run the ball as opposed to just one guy. These factors have decreased the dominance of running backs of fantasy, and adding a point per reception put the shift over the top. Leagues that award a point per reception (or even a half of a point) make wide receivers much more valuable, and you should be taking them early and often. This simple setting will also change how players are ranked within their own position. For example, there are some receivers that catch many passes but do not accumulate many yards (Jarvis Landry) while other players catch few passes but accumulate more yards (DeSean Jackson). Landry is MUCH more valuable in Points Per Reception (PPR) formats, while Jackson’s value goes up much more when there are zero points per reception. For these reasons, make sure you use rankings that reflect these settings. How many WRs can you start? Most leagues start two (plus a FLEX), but for those that start three, the value of WRs gets considerably boosted. You may have trouble finding rankings that reflect a three WR league, so I would recommend generating a SmartCheatsheet with these settings and looking at how much the Value Over Replacement Player (VORP) changes with this small setting. You’ll be pushing receivers up quite a bit. Do you start defensive players? I can’t help you there. These leagues are called IDP (Individual Defensive Player) leagues and they are not for the faint of heart. If you signed up for one of these as your first league ever, you will probably not do well. How many points per passing touchdown? Although an actual touchdown counts for six points, most fantasy leagues only award four for a passing touchdown (to keep QB scoring in check). This gives running QBs such as Wilson or Newton a little rankings bump. If the league awards six points per passing TD, traditional passers (Tom Brady, Aaron Rodgers, etc) retain their inherent value. Rankings changes should be fairly small in either direction. The most important thing to do to prepare for a draft as a fantasy newbie is to obtain player rankings tailored to your league settings. If your league is fairly standard across the board, you can get fantasy rankings from pretty much anywhere. FantasyPros has expert consensus rankings (ECR) for standard, PPR, and Half PPR leagues. This is a good place to start if you just want a simple cheatsheet. If your league isn’t standard (for example maybe you can start two QBs), you’re going to want to make sure you find a source that reflects your league settings as closely as possible. [Shameless self-promotion incoming] If you input your league settings and generate a SmartCheatsheet, it will rank players by their average draft position (ADP) in leagues closest to yours. Also, if you feel like you do know enough about the NFL to modify the rankings, SmartCheatsheet will allow you to do that. Whatever you do, just make sure you have player rankings tailored to your league before you enter the draft, and make sure you get those rankings as close to the draft date as possible. Updated rankings will reflected injured/demoted players and out-of-date ones may not. I am only going to be covering snake drafts in this guide. Auctions are popular draft formats as well, but are fairly advanced and probably not a good place for a newbie to start. In a snake draft, team owners pick players in a linear order, and then once everyone has picked and the round is over, the order reverses in the next round. As far as I know, there is no documented advantage for any draft position. If you’re drafting online, don’t just rely on the draft app of your league site to cross off and rank players for you. The default rankings for many league hosting sites are full of questionably ranked players and aren’t always tailored to your league. Make sure you either have your SmartCheatsheet open alongside the draft or some other cheatsheet that you can use to cross players off. The same goes for offline “live” drafts: don’t just use the draft board to inform your decisions, either print out your rankings or bring your laptop with them ready. You’ve got your rankings ready, so you know what players to pick. But what positions do you pick? And when? This seems to be the source of most consternation for rookie drafters. Here is my typical strategy. NOTE: These are just my opinions. I’m sure there are many fantasy veterans that wouldn’t agree with all of these. It may make you feel better to fill out that entire starting lineup before drafting any bench players, but it’s probably not going to help you win a championship. Players get injured, under-perform, have bye weeks, and lose their jobs. On the flip side, bench players may over-perform, take jobs, or otherwise get opportunity that you weren’t expecting. It’s important to build a roster that is prepared for the unpredictability of the NFL. What does this mean in practice? Consider the following situation: It’s the sixth round. You’ve already drafted three solid WRs and two RBs. You haven’t picked a TE or QB yet, so you’d like to get one, but the top ranked player on your board is a WR and he’s ranked way higher than any other positional player available. Don’t reach and take a lesser player in the TE or QB. Take your fourth WR and be happy that you just picked the best player. There are many times that I have drafted four RBs and four WRs before I draft one QB or TE. It just depends on how the board shakes out. With that said, you shouldn’t draft strictly from a “Best Player Available” approach. If you have three WRs and no QBs and you’ve got a WR and QB both up high in your rankings, feel free to take the QB. You don’t want to hamstring yourself in the future by completely avoiding whole positions for fungible value increases. Scarcity is an important aspect of fantasy football to understand. Players that play a position that is more scarce are harder to obtain and have an inherently higher value. Since most fantasy leagues force to you start at least two RBs and there is only one RB on the field most of the time, RBs are incredibly scarce and therefore valuable. Also, many NFL teams have gone away from featuring one star RB, making the few stars that do exist even more rare. In comparison, in a start-one QB league with twelve teams, only twelve QBs need to be started during any given week while there are 32 NFL starting QBs available. They are not scarce and less valuable. If the league starts two QBs, however, the position becomes much more scarce and valuable. Wide receiver scarcity is an interesting debate because although most leagues force you to start at least two, there are 60+ starting NFL WRs that score points on a weekly basis. WRs that contribute weekly are not in short supply. What IS in short supply, however, and is in my opinion the most important thing to have in all of fantasy, is elite WR production. The top tier NFL WRs in this day and age (Antonio Brown, Odell Beckham, Julio Jones, etc) are so productive and so consistent that a player of that caliber is extremely hard to come by and worthy of your top picks. When it comes to tight ends, there is Rob Gronkowski and then there is everyone else. A player of his caliber (and predictable production) is very scarce, but for the most part the non-elite production that other tight ends offer is not so rare. Gronk is consistently the only tight end worthy of a high pick. RB Scarcity made RBs the dominant picks in early rounds of fantasy drafts since I can remember playing fantasy. We’re talking about ten out of twelve first round picks every year being running backs. This year, that has all changed, as three WRs are the consensus top three picks in most drafts. Although a feature back is still the most scarce position in fantasy, the industry is catching up to the fact that drafting RBs high carries an incredible amount of risk. Due to the violent nature of the position, RBs have a much higher injury risk than QBs and WRs. Jeremy Funk of Dynasty Football Factory found that “early round running backs had about a 32% increased risk of missing significant playing time per season compared to that of wide receivers.” Running back has also become a devalued position for NFL teams as the league tilts more and more toward being dominated by the passing game. RBs are now paid less (comparatively), more fungible, and many can lose their job at the drop of a hat. This doesn’t mean you should avoid them early entirely, however. At some point their potential value outweighs their risk, and you should take one. Most expert rankings will reflect that. QBs are the most predictable and least injury prone offensive position in fantasy. The problem is that they are usually not scarce, and can easily be found. This is why I would never draft more than two in a 1-QB league. Most times I will only draft one. In 2-QB or Superflex leagues, their predictability intersects with a higher level of scarcity and makes them much more valuable. TEs get injured around the same rate as RBs, and besides Gronk, are probably even more unpredictable. The combination of scarcity, predictability, and lack of risk is what you’re looking for in a player early in your draft, and usually a wide receiver provides that. I prefer to draft RBs in volume: use your mid and late round picks to draft quality backup RBs or starters coming off of an injury or down year. Many of these guys won’t pan out, but many times you’re only looking for a few good games out of them, and even if you don’t get that you didn’t risk much. I would advise sticking to your overall rankings for the first three rounds and just taking the best player available (BPA). After that point, it’s fine to stray a bit (a bit! not too far) from your BPA to balance out your roster, but try to continue to draft straight down your positional rankings. Put another way, if you decide that you want to take a WR in this round and have one ranked highly, don’t skip over him and take the lower ranked Larry Fitzgerald instead because you’ve heard of him and you just need a WR. Stick to your rankings and don’t let name recognition sway you. If you liked Fitzgerald more than that higher ranked guy, then you should have ranked him higher from the beginning. Most cheatsheets/rankings you will find will include a player’s bye week as one of the main columns. Personally, I don’t take bye weeks into consideration at all. My teams change so much throughout the season due to trading, free agency, and injuries that I don’t feel like looking at one week two or three months from now is a good reason not to draft someone. Just draft the best player. If you don’t plan on making a lot of in-season moves, then I suppose bye weeks are something you should pay attention to, but you probably won’t be winning much without making moves. I know this is a lot to take in, but hopefully I cleared up some confusion and gave you enough direction for how to approach your drafts this year. Remember that the team you draft is not anywhere near a finished product and the real work begins once the season starts. Know your league rules, find/create rankings you can trust, and keep these strategies in mind when you’re drafting. Oh, and pick Antonio Brown. I hear he’s pretty good. How could you not pick a guy with a smile like that?